The title should probably also have read something about being cheap AF, also, but I decided on brevity. Pick a room in our new house, and it needs some work. I work beyond full-time, earning less than I need, so it almost goes without saying that repairs need to be cheap AF. I want to begin in the room that is truly the most horrendous, which would be any one of our 2.5 bathrooms. Seriously. I’ve seen cleaner toilets in third-world countries, and that is not even hyperbole. To date, we’ve tried bleach, scouring scrub, soaking bubbles, and a pumice stone to try and chisel away years upon years of accumulated… mineral content. Let’s just go with mineral content. Yep. This is in our HOUSE. The bathroom on the ground floor, a half bath, has a couple of updates already, but that stinkin’ toilet still needs to go (literally stinkin’.). It must have a poor wax ring seal between the toilet and the drain, too, because human waste has certainly been seeping into the concrete slab for eons. The smell is inescapable. I dread what i will find when I pull up those fancy linoleum floors. My wife, on the other hand, wants, nay, NEEDS, us to start with the kitchen floor and countertops. The linoleum in there is irreparably stained and just awful to begin with. It is an assault on the senses. The countertops are made of particle board/MDF/recycled fish sandwich wrappers, and were woefully refinished by the previous owners. I say woefully because their refinishing project consisted only of a single coat of black latex house paint laid overtop of the fish wrappers… black paint, by the way, that they did not reserve just for the counters, either; they also spread it over part of the tiled backsplash, floor, and base cabinets. Maybe they were going for a blended look, like an ombre kitchen? Believe it or not, this is actually a flattering photo of the countertops. We’ve got out work cut out for us. So what I figure is this: we approach this with a multi-pronged plan of attack. First, we will scrape up the linoleum floors from the concrete slab. Everything I’ve read about removing linoleum adhesive from concrete makes it seem like this part will be an effortless breeze. Also, that’s a joke. It is supposed to be a nightmare. Focusing on the bright side, I remind myself that I will have quite stout callouses by the end of this part. Then, we will level the concrete slab until we have a perfectly flush plane. Then, we will etch and clean the concrete and prep it for a stain. 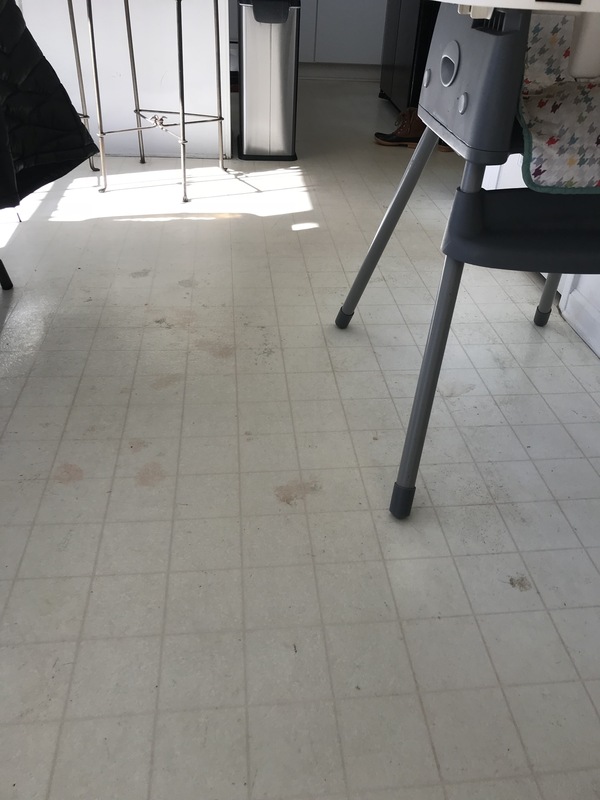 Then we will lightly stain it, and then we will seal it, and then one of us will trip over something and find out just how unforgiving concrete can be, then we will put down some other kind of flooring in the near future. 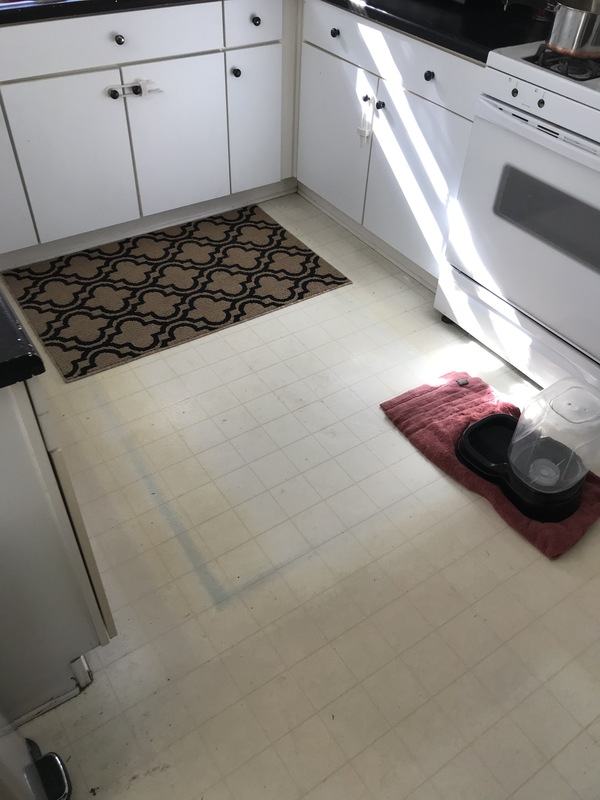 The second effort will be to re-refinish the countertops and cabinets and make them resemble something less depressing than their current state, like maybe we will go for a look that clearly delineates counters from tile from cabinets? This will begin with us scraping away a layer of black paint from a surface that I anticipate will not hold up well to having paint removed. I fear that the paint may be the only thing holding the counters together, what with their hills and valleys and swollen mounds of compressed wood shavings. Did I mention that they also painted the brass pulls? Like, why? They’re three bucks apiece. But sure, go ahead and slap some paint on ’em. Might as well, right? Then It will be time to redo the counters. There are a couple of DIY counter painting kits on the market. Both of the ones with which I am familiar have pretty good reviews. I am inclined to just do it all myself from soup-to-nuts, like a truer DIYer, but the volume of my past mistakes has become untenable. There is no more room for bad memories of half-baked ideas gone terribly predictably (remind me to tell you about the time I figured I’d cover up a carpet stain in an apartment by painting it back to its original color. Spoiler Alert: I lost my security deposit). So, I will give one of the kits a whirl and let you all know how it goes. A deftly painted optical illusion, like the counters actually become tile! Mind you, this countertop refinishing is just an interstitial fix, a stop-gap measure to keep us all from losing our minds every time we prepare food in there. Eventually I will pour my own concrete countertops with custom cutting boards for prepping food, and space enough to pull up some barstools to a solid-oak eating surface. When I’m ready to take a stab at making my own counters I’ll take the opportunity to tear down the backsplash tiles and replace them with something that we both love and can find on the cheap. The cabinets are the third prong. We don’t have the cash to buy all new cabinets at the moment, so we are going to spruce up the ones we’ve already got with some alkyd paint, door features, and new pulls. By “door features” what I mean to write is that I’m just going to slap some additional boards on there to make them all look less like garbage and more like not-garbage. A budget-friendly alternative option to sprucing up the existing MDF cabinets is to keep our eyes peeled for any remodels going on, in which older cabinets are being swapped out for newer ones. Habitat for Humanity has a bunch of retail sites they call their “Restores” (get it? ), and there are sometimes construction materials and things like cabinets, counters, sinks, etc. Some of them are in remarkably good condition and deserve a second life. We figure between these three things, and as long as you don’t look up at the ceiling, we will have a usable kitchen and dining area that doesn’t drive people to after-dinner surprise bulimia, or murder. Murder and a happy family, as it turns out, are not compatible. Photo creds for the featured image go to Celeste J Heery over at Deviant Art.